Olive Tree Genealogy Blog: Who Was Buried in the Grave and Where Did the Body Go? Who Was Buried in the Grave and Where Did the Body Go? This is a mystery story. I am hoping my wonderful readers will have some ideas for solving this bewildering mystery. My daughter-in-law was going through her deceased grandmother's papers recently and came across the photo you see on the left. 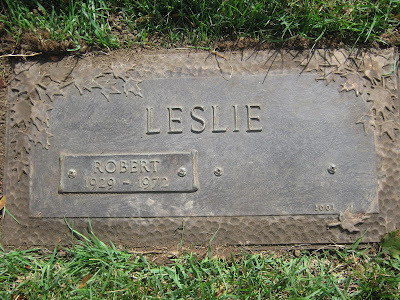 Robert Leslie was her grandfather, and this is his grave. 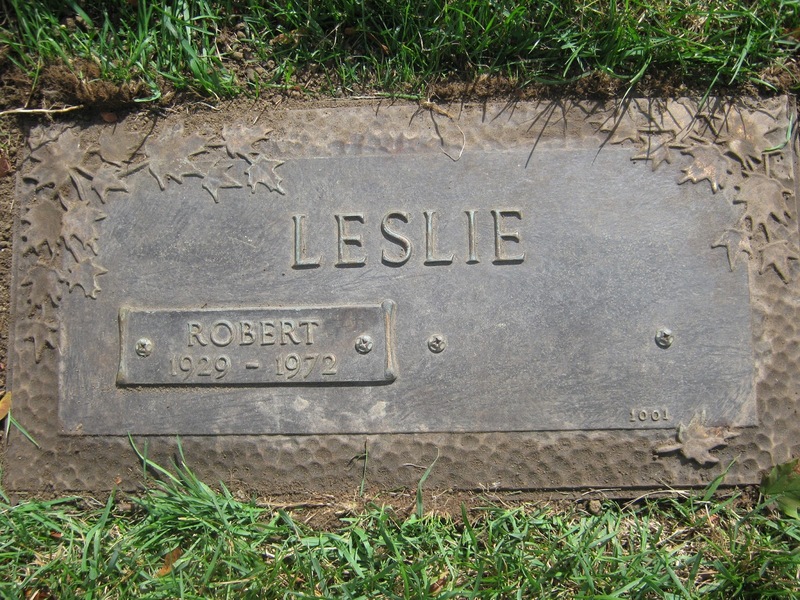 Robert Leslie is buried in Pine Hill Cemetery in Scarborough Ontario. However the family had no clue who was buried with him! They did not know of any Christine Leslie and Robert's wife Bernice (my daughter-in-law's grandmother) just died this year (2015). The plot in the cemetery had been purchased for two - Robert and Bernice. The stone had space to the right of Robert's marker which was intended for Bernice's name. Robert's daughter does not know why a marker with the name Christine and the dates 1922-1999 were on her father's grave. As far as the family knew, Robert had no sisters. So my daughter-in-law asked me to investigate. Due to Canadian privacy laws the last publicly available census for Ontario is 1921 so I could not look for Robert and his family to verify there was no sister Christine. Birth records are also not available for the time period I needed. So I contacted the cemetery. They informed me that the only person buried in the grave was Robert Leslie and there was only one marker on the stone. They also noted that the right side of the stone was left empty and a notation on the records stated a marker with Bernice's name on it was to be added on her death. I sent the cemetery the photo we have and asked if someone could actually go to the grave and verify that there was only one marker on it. They very kindly agreed to do so. The photo above is the photo they sent me on October 1st this year. As you can see it is the same stone but it only has one marker - for Robert Leslie. The marker for Christine is gone. I asked the cemetery if they would check their records for a Christine Leslie born 1922 and died in 1999 buried elsewhere in the Cemetery. A search was made with zero results. 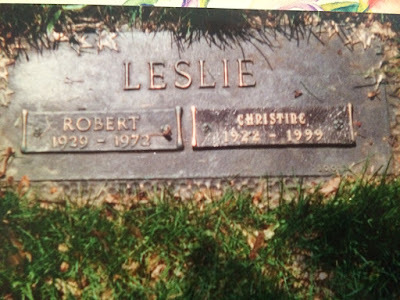 There was no one named Christine Leslie buried in their Cemetery and they had even searched their records by first name (Christine) and surname Leslie to see if anyone was buried there in 1999. The search came up empty. No Christines and no Leslies were buried there in that year. We have enlarged the photos to verify that they have not been altered. The photos are real. At some point in time the photograph of Robert and Christine was taken. We do not know when but we know it was Robert's son who took the photo and gave it to his mother. So many questions come to mind: Who was Christine? Why was her marker put on Robert's grave and why was it removed. Who put it on and who removed it? Was she ever buried in Robert's grave or was it just her marker on the stone? Did the cemetery make a mistake and put the marker for Christine on the wrong stone and they removed it? But if that was the case the office would have found a burial record for a Christine (surname unknown) buried there in 1999 - and they found no such record! 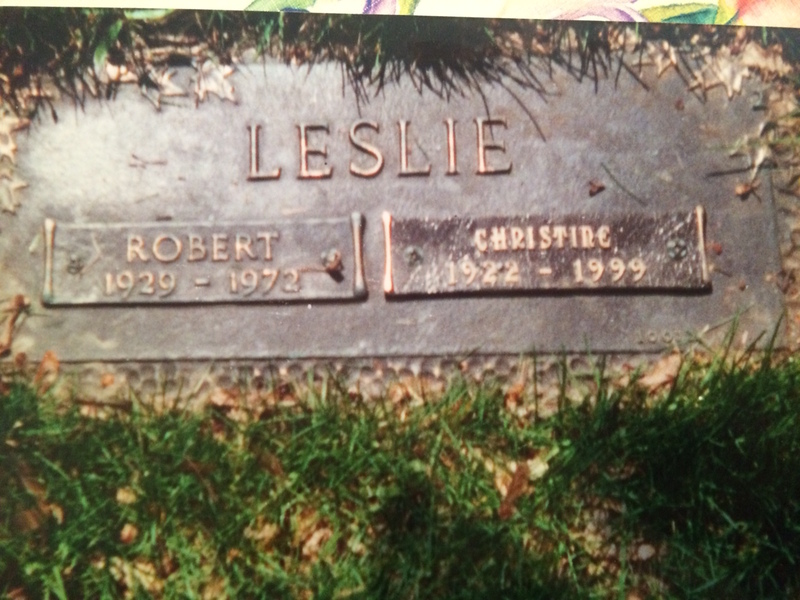 Did someone sneak into the cemetery at night and bury Christine's ashes in Robert's plot, then place a marker there? If so, who removed it, and why? My challenge to my reader is: Put on your sleuthing caps and see if you can solve the mystery of Christine! If you have access to the Toronto newspapers for 1999, maybe you can find mention of a Christine dying that year. Sounds like you need a shovel to get to the bottom of this one. Have you considered checking the monument companies in the area? A Company made and attached the plaque - am I wrong or is the letter "e" at the end of Christine written like Greek "ε". Its my understanding that cemetery offices/companies do not place stones or markers but Monumental Companies do. Check out the patina of the plaque the photo was likely taken within a few years of placement. It appears the screw near the T in the 1st photo is casting a shadow. Can you check with the local marker companies? Maybe they made a mistake. Maybe some one wanted a marker like Robert's and it was placed incorrectly. That is a real mystery, good luck. I do not have experience with plates like this, but I assume that after they are made, they could be attached by an employee of the firm, by a cemetery employee, or by someone chosen by the person who ordered them. It appears that it would require only a stout screwdriver. Am I being naive? Is there some mechanism that I don't see? It appears that someone working without adequate attention or instructions could mistakenly attach a plate to any stone. Then someone else, checking on it, might see the mistake and remove it. I think Christine's marker was incorrectly placed on the Leslie marker. Finding a Christine who died in 1999 and was to be buried in this cemetery is probably the way to find out to whom it belongs. Marian that was one of our "guesses" too but as I mentioned in my post, there is NO Christine who died in 1999 buried in that cemetery. That means the plaque could not have been placed there by a cemetery employee in error and moved later. Anonymous - that's a good idea to check with Monument companies! Thank you. Could there be another cemetery close by. Or, you don't need to dig, you need to find an engineering or survey company that either has ground penetrating radar (GPR) or a pipe locator. In Florida we have Sunshine One Call for locating pipes before you dig. If you have a similar organization where you live, call them to find out the closest locating company, they will have the equipment. How odd. It definitely sounds like an error and that Christine should have been elsewhere entirely. I don't suppose Canada has anything like the social security death index, where you could input the years of birth and death and the first name to narrow the search? Maybe she was meant to be buried in another cemetery?? Perhaps nearby? I did a search on Ancestry and found a Mrs. Christine Leslie on various Voting Lists. She lived in Waterloo. I don't know if that is close geographically, but she is on the available lists up to 1974. Her husband was Douglas. I don't know if this is any help. Good luck! Thanks Gail - I saw the Waterloo Christine Leslie but she's the only one I could find and Waterloo is quite a distance from Scarborough. It's not impossible though! The market has a number, 1001. It is possible that a Christine LNU, was to have had a marker placed, in a different cemetery, but the same number. The screws are at different rotations in the two photos. There was definitely a nameplate affixed there at some point. There appears to be a faint horizontal line where the bottom of the name plate would have been, possibly due to weathering. That may also be my imagination. Looking forward to more on this story. "Iris Stuart Perhaps it was an error in marker placement by the groundskeeper who placed markers at the cemetery. The wife discovered the error (hence the photo), notified the cemetery, and it was rectified. Probably no record exists of the error. Are there multiple cemeteries nearby run by the same company? The Christine marker may have belonged nearby with a coincidence plot #. I think it's safe to assume no one else is buried in the plot because the cemetery would know that. Where I worked in Santa Ana there were 3 cemeteries run by separate entities on the same acreage. We didn't know what went on at their plots or who was buried there and vice versa but we had people (and florists) mixing them up all the time." Her name wouldn't necessarily be Leslie if it was put on the wrong marker. Probably an innocent mistake, but a little eerie. So I take it that Robert's son, who took the photo, is not around? They must have called someone to have it removed after seeing the photo. Is there anyone at the cemetery office that has been there a while and might remember other than the people in the office, like the maintenance people or grave diggers? There might be someone in the office that has worked there a while and knows about it, but doesn't know you have inquired about it. If Bernice died this year, was she buried there? Did they find any evidence of another burial? if the christine died at the very end of 1999 would have been interred the following year, then get the cemetery people to check 2000 records. Wow my readers are amazing! so many good ideas I didn't think of! Checking the year 2000 in case Christine died end of 1999 (Duh for me not thinking of that), recheck the numbers bottom right corner of the marker in both photos, see if grave diggers etc might know more.... wow thank you everyone for helping me with this mystery. Oh and for those with eagle eyes for spotting all the tiny clues, that is impressive!! PS to Anonymous - Bernice has not been buried yet, the family is holding the Memorial Service and interment next month. It will be interesting to see if the cemetery discovers another body there - as they did when they went to inter my mom and dad in Woodlawn Cemetery in Guelph. Their records showed only my Grandpa in the grave so there was room for Mom and Dad - but lo and behold when they dug for mom and dad's urns, they found another urn with my grandmother's name on it! I actually wrote a blog post about this as no one knew where grandma was buried. Turns out my uncle snuck into the cemetery with a shovel and buried her urn without permission. That's why there was no record of her burial. Bernice must have been ALOT younger that Robert! I found a profile for Christine Violet Sigurdson on Geni.com. She was born May 8, 1922 and died March 19, 1999. MyHeritage.com has her obituary from the Winnipeg Free Press in Winnipeg, Manitoba, published March 23, 1999. On March 19, 1999 at St. Joseph's Health Centre, Christine Violet passed away. Christine was predeceased by her beloved husband Baldur, daughter Patricia, and brother Allan. She is survived by loving sisters, Mattie and Verna; as well as her devoted children, Jim and wife Marjan, Bill and wife Judy, Larry and wife Karen, Lorna and husband Glen; 11 grandchildren; and four great-grandchildren. The family gratefully acknowledges the selfless devotion of Christine's life companion Geoffrey Baldwyn. The memorial service was held at St. James Anglican Church, Cambridge, Ontario, on March 22, 1999 at 2:00 p.m. Interment at Lundar Cemetery, Lundar, MB. will follow on May 8, 1999. As an expression of sympanthy [sic] donations may be graciously directed to the Make A Wish Foundation. I searched Findagrave.com for the Lundar cemetery. It is listed, but only 6% of the interments are included. It would be interesting to visit the Lundar Cemetery to see if Christine's name plate from Robert's grave is on this Christine's marker there. Scarborough and Cambridge, Ontario (where Christine died) are very near to each other. Lundar is quite distant, but the obituary notes that she will be buried in Lundar on May 8th even though she died on March 22nd. P.S. In my opinion, both photos show 1001 on the bottom right corner of the marker. I think it is the quality of the photo that makes it appear as 1003 on the first photo. The whole marker would have to be changed for that number to change. Caroline, not sure why you think Bernice was much younger than Robert? They were born the same year - 1929. Robert was only 42 when he died, Bernice was 86. She never remarried. Shauna that's an intriguing find! Cambridge is also next door to Waterloo which is where the only Christine Leslie I found in the Voters Lists lived. I would like to see if Christine in Lundar Cemetery has the same plaque as on the photo we have! Got it Lorine. For some reason I missed the fact that Bernice was born in 1929! Sorry! What a mystery. I'll be following to see how this turns out. Wow. I'm totally impressed with all of this investigation. If it were me I'd take my metal detector to determine if there's large pieces of metal below. Perhaps when the wife is buried there will be an answer. Any chance there was another mate unknown to the other? This has the makings of a mystery novel. I also admit my second thought was "I think I can write a mystery novel using this as part of the plot!"